What if Frankenstein had got it right? Welcome to Promethea; a country carved from the chaotic politics of the Balkans in the mid 19th Century by Victor Frankenstein. Imagined as a bright focus for the industrial and scientific revolutions changing the world for the better, the reality is a dark, brutally feudal regime where all but the eilte must fear the Harvest. 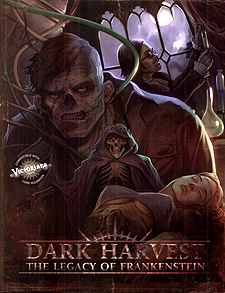 Part short fiction anthology, part alternative history sourcebook, Dark Harvest: The Legacy of Frankenstein is dark gothic fantasy with disturbing echoes of our modern world.